Hearing Terri scream on a trip is not unusual. In fact, it’s usually par for the course when she falls up a set of stairs or tumbles off a compost toilet* or trips over, basically, most anything. And since I’m about as coordinated, we rarely get alarmed when the other one lets out a yell. 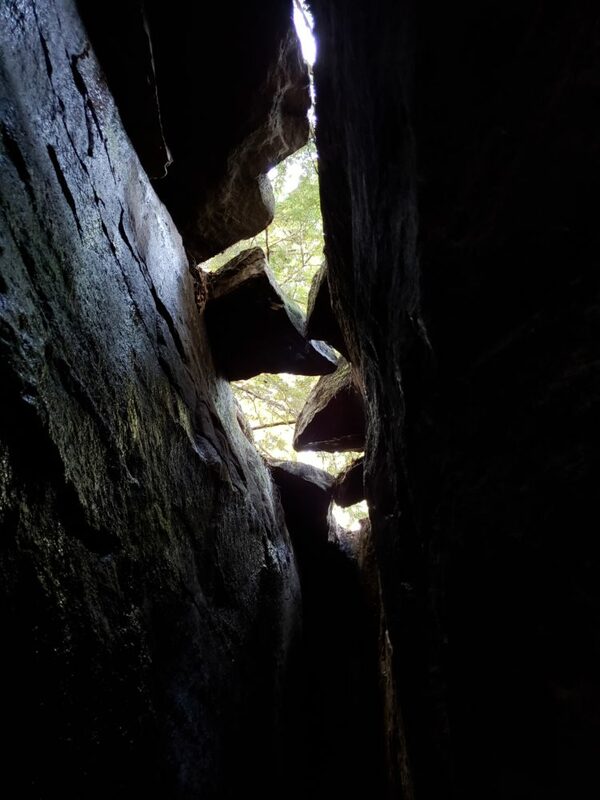 But I admit I was a bit taken aback when we were climbing through Bilger’s Rocks in Clearfield County, PA, because her husband, Greg, was on the trip with us. Unlike me, he doesn’t think it’s that funny when we hurt ourselves trying to act like we’re still 20. Terri: OH MY GOD! OH MY GOD! Terri: DID YOU SEE THAT? Vanessa: What??? Snake? Bear? A snake and a bear? A snakebear? Vanessa: Oh, for the love of all that’s….nope. You did not see Bigfoot. Terri: I totally saw Bigfoot! It was right up on that rock. And then it ran. Vanessa: Did you get a blurry picture? Terri: No. It was too fast. It was just there…and then gone. Vanessa: Like your common sense. Not everyone is tall enough to scale the rocks. At least that’s what she says. We continued on our climb through the rocks, and we learned a lot from our guide, who I’m sure was shaking his head at these city-folks—or just at our general lack of climbing ability. Bilger’s Rocks is a truly spectacular place to hike, consisting of 316- to 320-million-year-old sandstone formations that tower above the forest floor, some rising 30 to 50 feet overhead. Visitors can crawl through small openings, wander through barely-body-width passages underground, or just enjoy resting in the cool air. 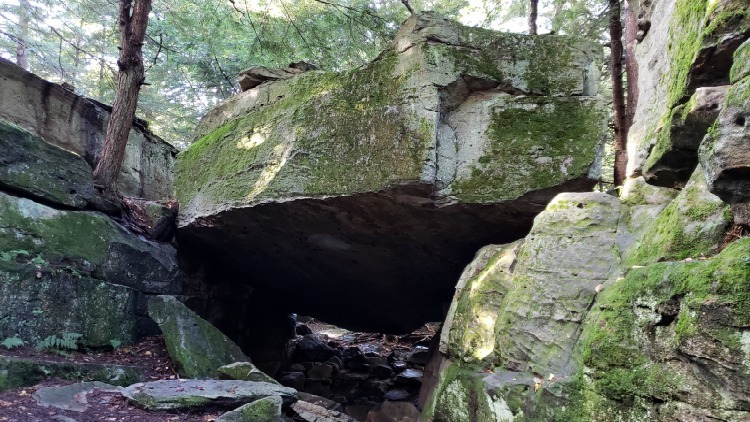 Bilger’s Rocks is actually cooler than the rest of the forest, which is wonderful surprise on a hot summer’s day. The view looking up from the ice cave. Otherwise known as the stuff nightmares are made of. Being somewhat claustrophobic and more than somewhat wide, I didn’t jump at the opportunity to tour the ice cave, a pitch-black passageway that wove underground for about 25 feet. You can see down into the labyrinth from up above, and trust me, that was as close as I’m ever going to get, except in my nightmares. 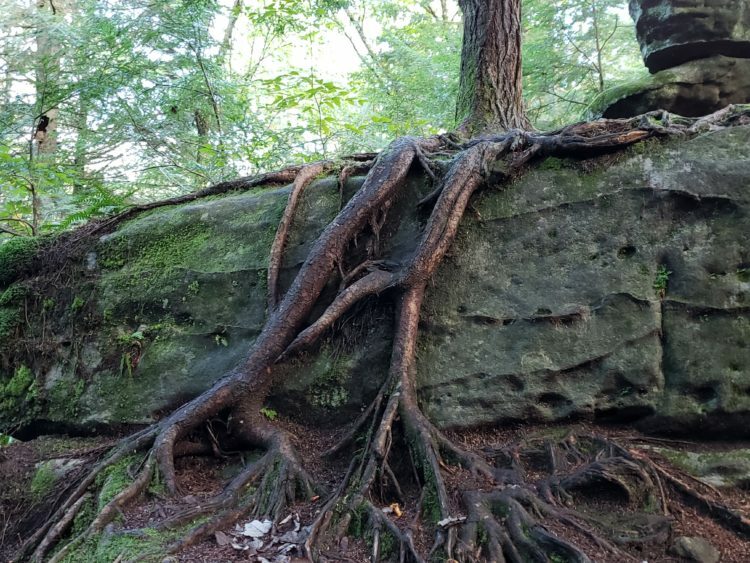 My favorite part of the hike was seeing where the trees took root and clung to the outside of the rocks, forming intricate patterns of natural art. And humans had left their mark in the area as well. 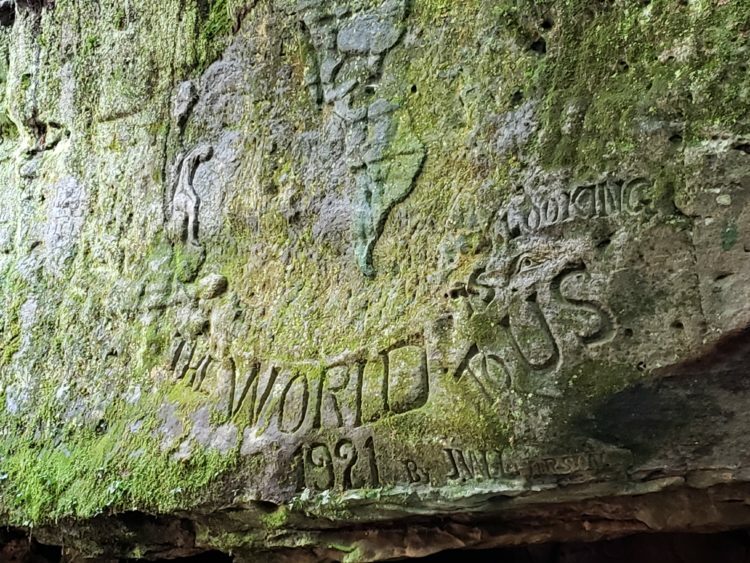 As a history buff, I was fascinated by a map of the Americas that someone had carved into the rock shortly after World War I—you can still see the 1921 date, as well as the message of solidarity left behind. Talk about clingy! Pretty sure that tree isn’t going anywhere. Legend has it that this was carved by a soldier recently returned from WWI. Respect. And while there is so much there to see in what’s known as “Rock City,” what there is not…is Bigfoot. Maybe Bigfoot Got Eaten by a Dinosaur? Sasquatch hunters should not despair, however, as there is another place in the county where you can see the ape-beast, or at least his likeness, as well as other incredible creatures. Doolittle Station, located off Rich Highway, not only has Bigfoot replicas eating ice cream, but an entire animatronic dinosaur display that makes it a must-stop while in the county. The history of this place, owned by Dr. Jeffrey Rice, is actually a whole ‘nother story, which we’ll be telling you about soon (we can only write so fast). What you need to know right now is that it’s got dinosaurs, Elvis, Bigfoot, craft beer, train cars, amazing food, mini-golf, scratch-made pizza and more…and you can even stay in a renovated caboose overnight. Maybe stalking Bigfoot wasn’t such a good idea? **Seriously, never travel to Belize with Terri. Bilger’s Rocks is an amazing place to spend a day, and they also offer overnight camping. Learn more about this natural wonder, including how it was formed (you know, the science stuff) at http://www.bilgersrocks.net/. 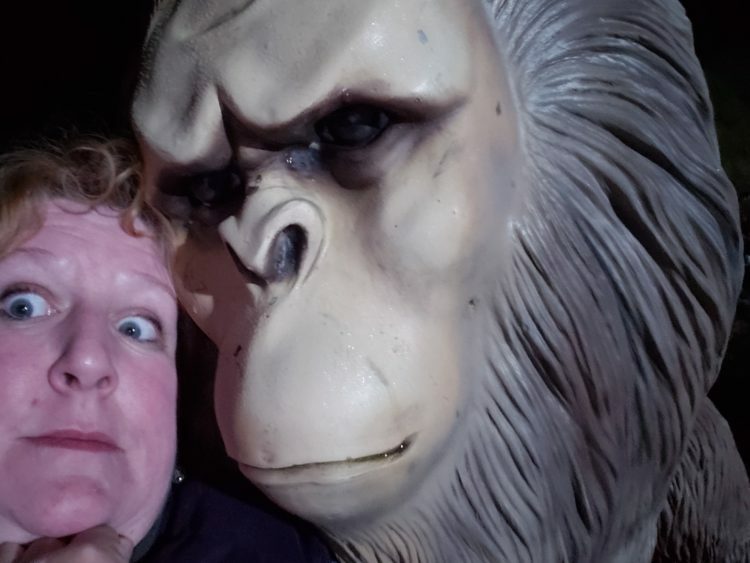 If you prefer to spend the night indoors, hanging with Bigfoot statues while listening to live music and sipping on a local beer at a nano-brewery, check out Doolittle Station at http://www.doolittlestation.com/. For a look at all of the cool things to do in Clearfield County, from monsters to mating elk (seriously—it’s a whole thing there), visit http://www.visitclearfieldcounty.org/.